Anna Jameson was the first English art historian. Born in Ireland (she migrated to England at the age of four), she became a well-known British writer and contributor to nineteenth-century thought on a range of subjects including early feminism, art history (particularly sacred art), travel, Shakespeare, poets, and German culture. 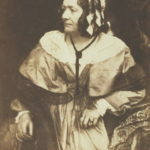 Jameson was connected to some of the most prominent names of the period including Fanny Kemble, Elizabeth Barrett-Browning and Robert Browning, Harriet Martineau, Ottilie von Goethe (the daughter of Goethe), Lady Byron, Charles and Elizabeth Eastlake, and Barbara Leigh Smith Bodichon. "In morals what begins in fear usually ends in wickedness; in religion what begins in fear usually ends in fanaticism. Fear, either as a principle or a motive, is the beginning of all evil." "Conversation may be compared to a lyre with seven chords – philosophy, art, poetry, love, scandal, and the weather."